This blog’s “What the Guardian wont’ report” posts typically highlight news which we feel is vital to accurately understanding the Israeli-Palestinian (and Israeli-Islamist) Conflict, but which doesn’t comport to the Guardian’s political narrative and so is ignored by their reporters covering the region. As such, it is impossible to engage in a rational debate about the root cause of the conflict without acknowledging the degree to which antisemitism and the glorification of violence against Jews permeates Palestinian society and, moreover, how such culturally normative racism represents one of the greatest impediments to peace. At the end of the day, if Israelis aren’t reasonably sure that a future Palestinian state will accept the existence of a Jewish state, and will inculcate their children with the values of peace, tolerance and pluralism, most will continue to be skeptical of further territorial concessions which could strengthen the most malevolent Palestinian political movements. The significance of the following story simply cannot be dismissed or rationalized by anyone sincerely passionate about promoting peace in the region. As you recall, on March 11, 2011, five members of the Fogel family were killed in their home in the town of Itamar by Palestinian terrorists from the Awad family. 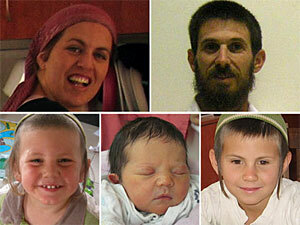 Hakim Awad led the attack, killing the parents Ehud and Ruth and three of their children, aged 11 years, 4 years, and 2 months. Official Palestinian Authority TV broadcast greetings to the murderers of the Fogel family from the relatives of the killers and from the PA TV host. As PMW noted, it was Hakim Awad who killed Ehud and Ruth Fogel and their young children by stabbing them repeatedly with a knife. I suggest that you consider sharing the following video of the Palestinian program described above not as “hasbara”, but merely to reach those who are still open minded, so they might ponder the injurious impact of such morally toxic messages within Palestinian society on the peace process. The program, about which neither Harriet Sherwood nor Phoebe Greenwood will ever report, was broadcast on official state-run Palestinian TV on January 19, and repeated again on January 21. What can I say, except quote Dr Wafa Sultan, the Syrian psychiatrist now living in the US, who tore into an imam who condemned her as an apostate on Al-Jazeera. “The danger lies not in the weapons themselves but in the hand that grasps them …. The schools responsible for creating the terrorist mentality in the Muslim world are more dangerous than any weapons factory on earth. These schools have destroyed people’s minds…. Who, having watched the video above can doubt the extent of what Dr Sultan calls the moral disintegration which gives rise to such egregious filth? Harriet believes Israel is supposed to make peace with Palestinians who behead Jewish babies in the beds, glorify Hitler in the PA’s media, glorify every massacre against Israeli civilians from the Sbarros massacre, Disco Massacre, Passover Massacre. Even when the Palestinian Nazi Mufti’s call for all Jews to be murdered and that Jews are Apes and Pigs that doesn’t even bother Harriet. The question is why Israel allows this Harriet Arabist to report there. This is just more proof the Palestinians have no humanity. Ed, as Mitnaged refers to Dr Wafa Sultan as saying, the influence of Islam itself upon ignorant people, undermines any compassion or human kindness in these apologies for human beings. Yet say that, even here, and there are squeals of “Islamophobia” and accusations of racism, in spite of the fact that the inhumanities are recorded and out there for the world to witness. And the Guardian and CiF are in some ways even worse than they are for promoting their filth on their pages. As I noted yesterday, the Guardian seems to consider requiring the Palestinians to abandon hate speech against Jews as an unacceptably extreme position. The Guardian itself is as mired in hatred as they are! It sees nothing wrong in such behaviour so how can it condemn it in others? No doubt someone like Jay Stoll, President of the LSE Students’ Union Jewish Society, would consider it Islamophobic of the Guardian to do so. We need more dhimmis like him. This sick praise for a brutal child-murderer shows just how debased Palestinian society has become. Of course the Guardian dare not report it. If the British public became aware of the extent of Palestinian racism, and the way they parade their evident delight in the murder of Jewish children, support for their cause would evaporate in an instant. Andy Gill, you would be very surprised, or perhaps not surprised at all, at the extent to which wilful blindness on the part of the British public plays a part in the creeping Islamisation of the UK. Brits either ignore it or persist in adopting attitudes towards it which have been known not to work or to make matters worse. So no, I doubt that the British public will care much until it is too late. The slaughterer of Itamar’s babies was unabashed, as very few, other than the Nazis and Khmer Rouge, ever were. I noted on Sunday that the mother and aunt of Hakim Awad, one of the murderers of the Fogel family in Itamar praised him on official Palestinian Authority TV. At the time of the arrests, however, the same mother of Hakim Awad was adamant that he was innocent! Nouf Awwad told Ma’an on Sunday – the day reports of the allegations against her son were made public with the lifting of an Israeli gag-order on the case of the slain settlers – that Hakim was still recovering from a recent surgery, which prevented him from walking long distances and required him to use the toilet every hour. “We have the medical records, he is in unstable health,” she said, adding that the family is gathering the papers to present as evidence in defense of Hakim. She said Hakim had undergone testicular surgery in November at the Rafidiya Hospital in Nablus. “He was at home [the night of the murders] and went to bed at 9:30 [p.m.],” she said. Hakim, who was detained in early April during the third sweep of detentions carried out by Israeli forces, has remained in detention since that time, and has had no contact with his family. Nouf said she “could not rule out” the idea that her son had been tortured and confessed under duress. Anti-Israel activists seized on the mother’s statements as “proof” that Hakim was tortured and framed by Israel. Once the murderers confessed in open court as to how proud they were, these critics became curiously silent about their previous accusations. And they continue to believe the obvious lies that Palestinian Arabs spin about Israel without any skepticism.